Janesville: An American Story, by veteran Washington Post staff writer Amy Goldstein, is a case study of de-industrialization in an American factory town. But Goldstein, unlike many of those who write and opine on this timely subject, is not interested in diagnosing our national ills from on high. Instead, in Janesville she shares the stories of some two-dozen Janesville residents as they adapt to a new economic landscape in the years following the shuttering of the town’s General Motors plant. After more than eighty years of production, the Janesville General Motors plant shut down in 2008. Goldstein describes how the closure cast doubt on the future of 4,800 middle-class workers—as well as the economic vitality of the region. As government officials, business leaders, and others scrambled to respond to the closure, thousands of workers were forced to replace lost earnings in a stagnant job market where many of the available jobs paid half the GM wage. Janesville follows Matt Wopat, a GM employee who saw his family’s savings dwindling along with any hope that GM might re-open the plant. Wopat decided to pursue certification as an electrical lineman at the local Blackhawk Technical College, where dozens of class sections were added in anticipation of the surge of new students. When anticipated lineman jobs failed to materialize, Wopat dropped out of the program and became a “Janesville Gypsy”; like many former Janesville plant employees, Wopat made weekly trips to and from a GM plant in Fort Wayne, 270 miles from his wife and kids. Wopat’s story, like the stories of the educators, bankers, politicians, job re-trainers, and others Goldstein captured in her over two years in Janesville, underscores the challenge of supporting a healthy, prosperous working class in modern-day America. As many communities across Wisconsin struggle today to keep or attract good employers, Goldstein’s chronicle of Janesville can be plumbed for encouraging stories of individual resilience and lessons in how communities can pull together to weather hard times. But, as the story also reveals, there is no obvious path forward in the face of complex and unpredictable economic, political, and social forces that lie beyond our control. 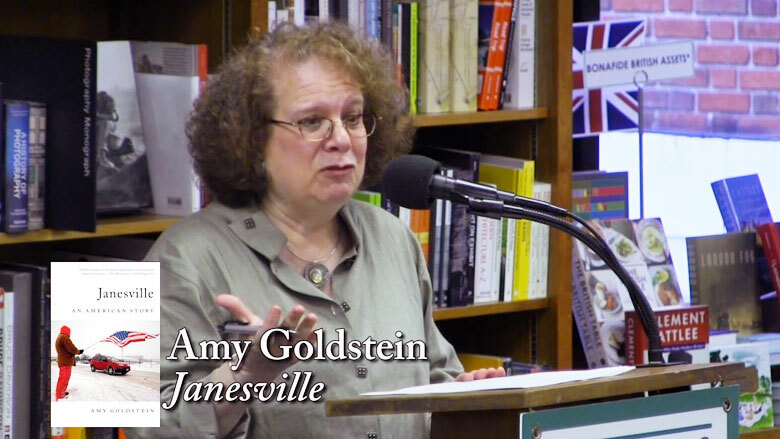 The Wisconsin Humanities Council invites you to hear Amy Goldstein talk about Janesville at this year’s Wisconsin Book Festival on November 4 at Madison Central Library. This event is sponsored as part of the WHC’s Working Lives Project.